It’s a joy to be an avid bike rider. The exercise, the satisfaction of feeling healthy, the fresh air, the speed, and the thrill of freedom! But some days the weather just doesn’t cooperate. Or, you don’t feel in the mood to lug your bike to a remote trail. Maybe you just want a simple and intense workout while watching a racing video. The answer: a bike trainer. Here are some key considerations as you ponder and carefully evaluate your purchase options. Let’s start with the most critical element. How is the trainer built? You want one that is well-built with sturdy, non-rusting materials so it is built to last. It needs to be stable on any surface and able to support a substantial weight load. Big enough to support you and your bike, but small enough to put away easily when not in use. You will want easy assembly and an easy attachment to your bike. Depending on your exercise plans, the resistance levels that you want in your trainer may differ than someone else’s. Do you want any extra resistance variation in the stand to simulate different riding conditions? 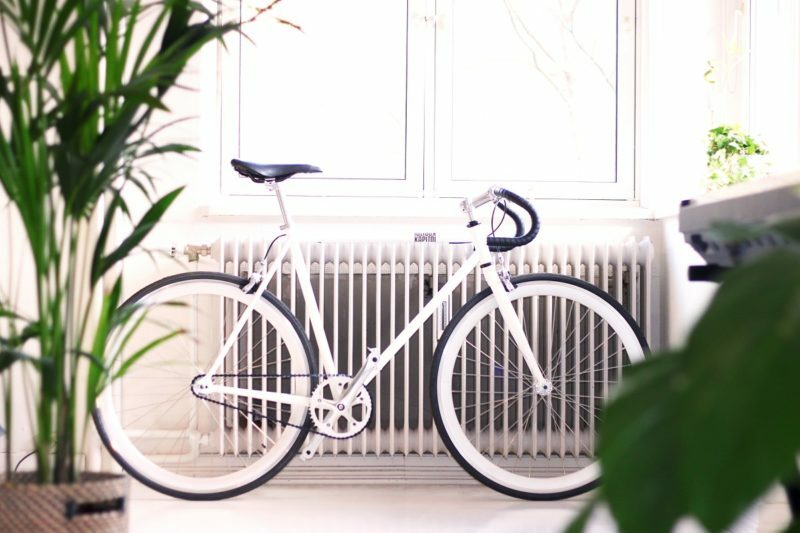 Or, do you prefer the simplicity of varying your exercise by simply shifting the gears on the bike itself? How much trainer tech do you want and will you use? Some bikes even come compatible with online training apps. No matter where you use your bike trainer, you don’t want to disturb other people in your home or building while you exercise. That calls for a very subtle device with a reliably quiet and smoothly consistent design. Also, the strength and stability of the stand design should minimize vibrations and any normal bike noise (just don’t yell a lot while you are riding). 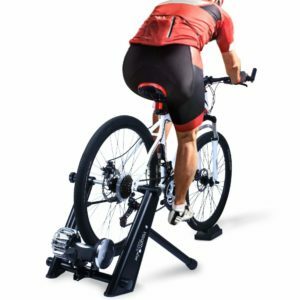 Here are some great bike trainer options as you prepare to purchase the one that will optimize your exercise plans. This high-quality bike trainer fits any road or mountain bike with a 26 to 28-inch wheel. It offers great stability, featuring a wide base and five adjustable rubber feet that hold your ground and even-out the flooring. With this trainer, you get six resistance settings to give you a great variety of exercise conditions and choices. It’s quiet too. The Sportneer bike trainer stand is available in either black or red and has any easy bike release that makes taking your bike from the stand to the trail or road a breeze. It’s secure without holding your bike for ransom. Reviewers mention that this trainer stand is pre-installed which makes setup straight out of the box a breeze. One also mentions that mounting and unmounting the bike is easy, and the structure feels strong and secure. With this bike trainer, you get extra stability — they’ve widened the frame and base to support up to 370 pounds and prevent wobble. The trainer fits bikes with 26 to 28-inch wheel sizes. 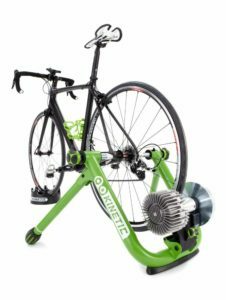 Featuring a fluid chamber, this trainer provides a variety of resistance options according to your pedaling speed. And yes, it is nice and quiet. 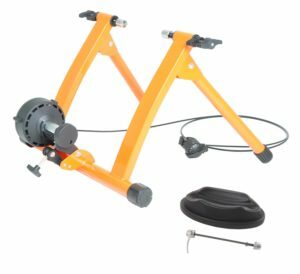 Reviewers mentioned that this bike trainer helped them keep in shape during those cold and wet months and is a great option if you have a bike with wider tires. This bike trainer is made of durable hi-tensile steel and built to last. Its extra wide frame and wheel blocks will give you a safe and stable ride. You also get multi-speed versatility including a remote shifter so you can quickly change resistance levels to alter the pace or intensity of your exercise regimen. 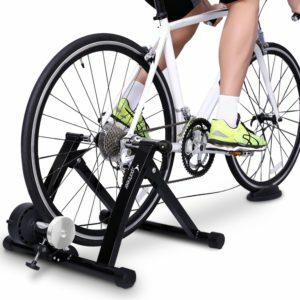 Reviewers mention that this bike trainer is very easy to set up, though the directions themselves aren’t very helpful. Another reviewer mentions that the range of the resistance isn’t particularly impressive, with setting 1 feeling like a flat road, and 6 feeling more like a 3-foot incline. She does mention that the quality overall is exceptional, but if you’re looking for a steeper climb you may want to go with a different option. For a truly one of a kind smart bike trainer, consider the Kinetic Road Machine. 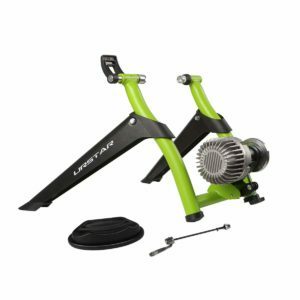 Compatible for any size bike with 22 to 29-inch wheels, the unit comes with a pro flywheel, offering 12 pounds of extra inertia. It also includes an inRide sensor connecting wirelessly to Kinetic’s inRide app for more powerful workouts and fitness testing. This trainer comes with a lifetime warranty, and each frame is made out of powder-coated tig welded steel. Structural elements are made out of either aluminum or steel, and the knobs and feet of the unit are made out of ABS plastic overmolded with rubber. This encourages better ergonomics, stability, and grip. Reviewers mention that this trainer offers a smooth, fluid ride and the unit comes pre-assembled. Another reviewer mentions that at the minimum, you should connect your smartphone to the trainer to visualize your watts, cadence, and speed. You’ve got it easy with this bike trainer. It’s easy to fold and move, easy to set up, and attaches securely to your bike. Crafted out of steel, this trainer is built tough and sturdy to use while offering a stable and smooth ride. It supports up to 330 pounds and is intended for any bike with a 27 to 28-inch wheel. You’ll find power with its 750 watts of flowing resistance and a wide resistance range. As for shifting gears, the URSTAR bike trainer stand comes with a bar mounted remote control to change the resistance as you move rather than having to hop off the bike to change it. Something to keep in mind, however, is that multiple reviewers mentioned that the trainer is fairly noisy when paired with a mountain bike.